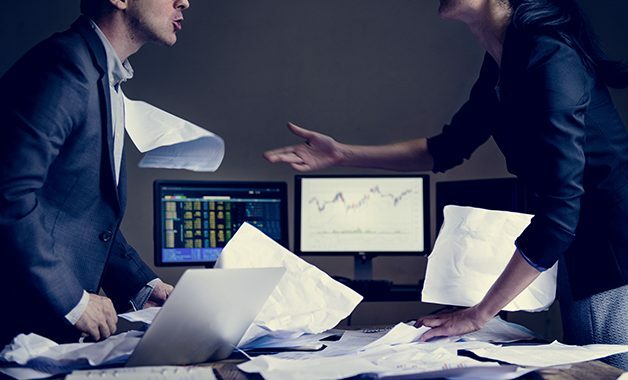 The dictionary defines conflict as “a serious disagreement or argument, typically a protracted one.” The word comes from Latin conflingere meaning to come together for a battle – not a great prospect when you are running a business! A lack of common understanding. Outside factors causing things to not go according to plan. These all become worse where there is a lack of communication and get worse the longer they are left. The irony is that conflict in our working relationships does not finish the minute we lock the office door and when brought home can trigger issues in our personal relationships. Business owners often feel they either need to keep issues from their family which means they either suppress their feelings which may start to simmer or makes them take out their feelings on family members who do not understand why. In the workforce, conflict may arise due to a poor relationship between staff or may be due to a problem with a task. People often react differently when under pressure than when work is flowing freely and people who are unable to take responsibility will find others to blame. If the issue is task-based, if it is talked about early or systems exist such as bringing in a supervisor, it can be constructive, and people can work together with the “issue” as the common enemy. Relationship breakdown (which may arise from not dealing with an issue) is more difficult to address especially once accusations and personal insults have been exchanged. In the case of people who deliberately invoke conflict as a game or to boost their power, such relationships are toxic and if possible should be avoided or closed-down. These situations take up a disproportionate amount of our headspace as well as causing problems usually for little financial reward. Look at your own business relationships – where have you been unreasonable or not understood the other person’s perspective? Do you have strategies to curb conflicts before they arise? Are you in any toxic relationships and if so can you bring them to a close? Fiona is a qualified chartered accountant, insolvency practitioner and civil and commercial mediator. Fiona qualified in both accountancy and insolvency with a Big 4 accountancy firm. After three years of audit, she worked in a variety of insolvency assignments including the administration of Air Europe in 1991. She spent a year working in the Middle East before setting up an insolvency practice for a local accountancy firm in 2001. In 2015 she broke away to work on her own and in order to extend the services she could offer to support business owners facing difficulties she qualified as a mediator.